(Bloomberg) -- Tiffany & Co. was one of the few bright spots on the S&P 500 Friday. The jewelry maker rose as much as 3.8 percent after forecasting slight growth for the year ahead. 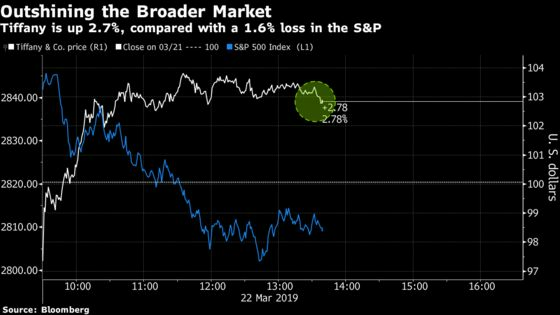 That was enough to reverse an earlier loss of as much as 2.8 percent and trigger a rally that’s among the biggest on the benchmark index. One of the company’s most closely watched retail gauges -- same-store sales -- came in flat, slightly below the Street’s average estimate for a 0.1 percent gain, the firm said during its fourth-quarter earnings release. But on the bright side, Tiffany expects single-digit growth in earnings per share and sales this year. Fourth-quarter per-share earnings came in at $1.67, beating the $1.60 average estimate. There weren’t too many surprises, as the company had already announced in January that its holiday-period performance was short of the jeweler’s own expectations. Tiffany is up 6.6 percent this week, the biggest gain since November. That compares with the S&P 500’s 0.7 percent drop over the last five days.